SWIM CAMPS in COSTA RICA! 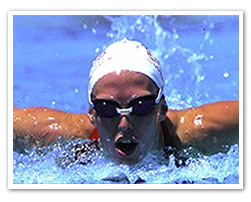 Are you a Master or competitive swimmer? 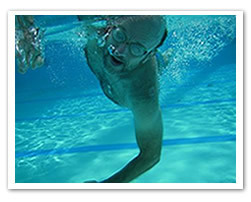 Tired of swimming in an indoor pool during the cold winter months? Mar y Selva Ecolodge has the answer! Located about a mile from some fabulous beaches, Mar y Selva Ecolodge boasts the Southern Pacific Coast of Costa Rica's ONLY 25 meter lap pool. For those with an ocean swim in mind, there are several alternatives, including a swim from the point at Punta Uvita (Uvita Point) to the shore, or a swim to the Tres Hermanas (Three Sisters) Islands from Playa Ballena (Ballena Beach). There are 5 beaches within 8 kilometers (5 miles) of Mar y Selva Ecolodge. Would you like to set up a Swim Camp for your team? We would be happy to help you organize a Swim Camp for your team in an environment where training can be serious while enjoyment will be paramount. Groups receive good discounts. Triathlete's also will find summer riding and running conditions year round! Experience the other type of biking. See Mountain biking. Runners will find the dirt roads challenging, and miles of beaches are readily available for interval training. Mar y Selva has mountain bikes and tandem kayaks for rent. The islands just off-shore from Playa Ballena boast some of the best snorkeling along the Southern Pacific coast. They are about a 20 minute kayak from the shore. From December to April you can often see whales, dolphins and sea turtles in these waters. It is a breeding ground for many whales.